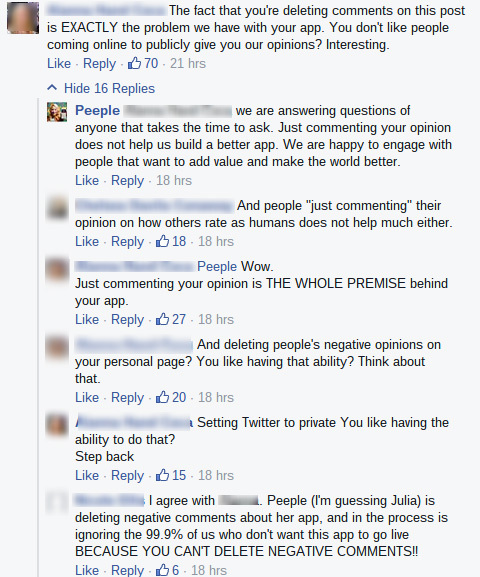 Julia Cordray, one of the two founders of that ill-conceived Peeple app that was announced this week that would allow everyone to rate and review everyone in their lives for all to read, has been scrambling to save face as pretty much the entire internet has come after her. The Register and others report that as Calgary, Canada-based Cordray and partner Nicole McCullough try unsuccessfully to convince the world that their app is all about love and positivity, the internet took no time getting out their pitchforks, and Cordray is struggling to handle the flood of negative comments her app idea has gotten on Facebook. As happens on the internet, there's even what appears to be a fake Twitter profile for Cordray (started on October 1) that portrays her as an earnest defender of her app, saying things like, "Innovators like me are persecuted for trying to better the world." But the real Cordray, via Facebook (see below) wishes she could turn off the comments section on her company's Facebook page, for obvious reasons. Cordray's real Twitter, @CareerFox, hasn't seen a new tweet since last weekend, before this story blew up via a scathing Washington Post piece on Wednesday. Unfortunately, the real Cordray does seem to be just an earnest Canadian businesswoman who earnestly believes this app can be used for good. But as the internet is wont to do, she has been inundated with comments like "You will find out the hard way what a monster you have unleashed" and "You are human filth." Cordray has also tried to engage commenters on Facebook, trying to keep the discussion positive, to no avail. She has also had comments deleted, as Snopes reports. As you can see in this recent clip from Canadian TV, up in Canada  where they are much nicer than in many places  they were WAY kinder and more optimistic about the safeguards that the Peeple app will supposedly have in place  only positive reviews of you show up if you have not signed up for the app yourself, and when you do sign up you can dispute negative reviews of yourself, somehow, and there is some conflict resolution process. But is Peeple a real thing that's anywhere near a production stage? Snopes poses this question, suggesting that there is no mention of it anywhere before August 2015, and that there's a hint in the Washington Post piece that Cordray could have other ambitions all together, i.e. "publishing a reality Web series about the app’s process." But Cordray and McCollough told the reporter there that they had legit investors, and a current valuation of $7.6 million. Sidebar: The name Peeple is already being used by a UK-based, internet enabled peep-hole for your front door, as Wired points out. Snopes also points to an earlier description Cordray gave of the app not as a review site for anyone (including your romantic exes), but as an extension of her recruiting business, CareerFox. On August 1, she wrote, "Now we’ve innovated again and made Peeple, which is the next generation of recruitment in an app where you can find talent geographically through key word searches and see how talented they really are professionally as commented on and rated by their peers." That's a far cry from how she and McCullough described the app to the Post two months later, so this is curious. But suffice it to say the app appears to have evolved, and ever the positive person, Cordray writes on Facebook, in response to all the negative feedback, "People are genuinely good. Even though Yelp has over 47 million reviews and all the users are anonymous ... there are 79% positive reviews. (We are not anonymous as users of the Peeple app which should make our positivity even higher than Yelp)."